It is very much common for dance studio owners to experience a rough day for class attendances. But sometimes these rough day turns into weeks or months. This means that your class scheduling process needs a revamp. The dance studio manager software can help you keep track of attendance and also develops effective planning to increase your class attendance – and generate a demand for more sessions in the process. KEEP YOUR MEMBERS HAPPY – Signing up for dance studio membership isn’t just about teaching the students the steps of the ball dance. Your members are paying money for this privilege of being fit and healthy at the same time. Therefore, you, on the other hand, need to justify the cost of the equipment, facilities, classes, training, support services, and overall levels of customer service that you provide. Often it becomes difficult to keep an eye on all these activities and aspects of your business. But with our Dance Studio Manager Software, you can easily keep track of your membership, registrations, class schedule, the flow of money through your system, fresh bookings, and of course, you can keep track of attendance. LISTEN TO CUSTOMER GRIEVANCES – Its natural for people to have hindrances with the attention and services they receive. And, if you want to retain the loyalty of your membership, be prepared to listen to these concerns, and more importantly, act on them. Always be aware of what is going on in your dance studio. The feedback and complaints from your members should be the true red flags. Enable the channels of communication for your members so that they can express their feelings. This can either be done by exchanging a word with the trainer or dropping a formal suggestion in the box or writing it on the noticeboard. KEEP YOUR STAFF & MEMBERS IN THE LOOP – Our Dance Studio Manager Software also provides detail analytics and reporting facility. It helps you generate reports for income received, financial history, class schedules, accounts and more. This can help increase your revenues by understanding what is increasing your class attendances. Nothing can beat the true and exact data analysis. You can notify your staff about schedule changes, promotional offers, and class-specific guidelines through push notifications and message. The same mode of communication can be used to keep your members up-to-date with the latest developments in your dance studio, including class timetables and schedule changes, special offers, and new facilities. SEEK HELP TO SPREAD THE WORD – The existing members can be one of your greatest promotional and marketing tools. All you have to do is give them the means and the incentive and they will spread a word about you. These incentives can have the dual benefits – it can increase your membership and give your existing members more reason to attend classes, as their friends will join them too. 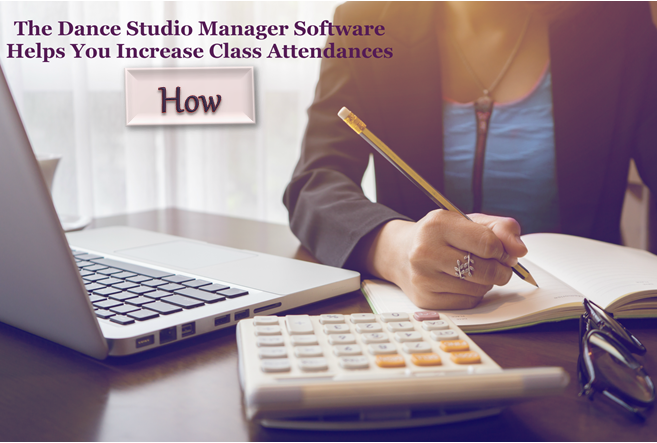 Our Dance Studio Manager Software can play a significant role in increasing class attendances as it handles class attendance tracking, recall and reporting. It also helps you drastically increase your membership base and drive revenues for your business.